Looking for sprayers? We’ve got you covered. Flaman carries a wide selection of chemical sprayers from brands like BE, Workhorse and Enduraplas. Whether you’re in need of a handheld option for your garden, or something larger like a boom or ATV sprayer for your farm or acreage, we’ll help you find the right fit for your needs and maximize your efficiency, all at the right price. 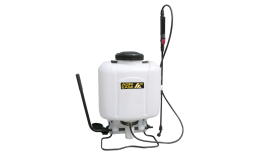 From BE, we provide a selection of compact sprayers that include handheld, backpack and pull behind models ranging in capacity from 2L to 60 gallons. These sprayers are ergonomic, have coverage of up to 10 feet, feature adjustable nozzles for precise control and large mouths for safe and easy filling and handling. Workhorse, a leader in the industry, has compact, utility skid mount, tow behind, ATV and 3-point sprayers available at Flaman for your convenience. Engineered for performance and reliability, Workhorse sprayer models feature tanks that are impact resistant and made from corrosion resistant polyethylene. Enduraplas sprayers are the result of decades of development and research manufacturing products for effective liquid management. The tanks of their ATV Boomless, Spot, Trailer, UTV and 3-point hitch sprayers are designed with thicker polyethylene walls, to increase their durability and resistance to corrosion. 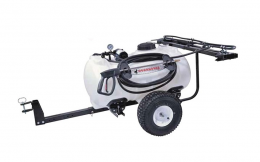 The largest option available, a 100 gallon 3-point sprayer, features a 20’ boom, and a horizontal spray distance of 35 feet, making it an excellent choice for covering large fields. 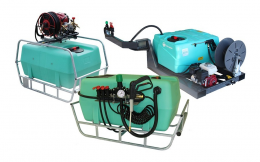 At Flaman, we understand the importance of maintaining the health of your garden and fields, which is why we take pride in providing an extensive selection of sprayers for you to choose from. Our 9 dealerships across Western Canada are stocked with spraying equipment and accessories to help your garden, acreage or farm thrive. Visit your nearest location to learn more about all that we carry from one of our friendly and experienced team members.